We are the largest home finance company serving rural India. Our aim is to transform rural lives by helping people arrange funds for constructing, renovating, and extending their homes. We are proud of our progress so far. Home loans traditionally required excessive documentation and stringent processes that often left customers confused. These factors pushed us to find a solution. As a result, we created a mechanism that provided credit to the underserved while being easy to understand. He lives in village Chada, Tehsil Kuhi with his father, mother, wife, brother and 2 children. They took loan of 1 lakh to add tiles, plaster and paint to his newly built home. He has finally been able to realize his dream of providing a safe andcomfortable home for his family. After living in a joint family for a while they wanted to live in an individual home with their three children. They purchased a piece of land in hopes that they will build a home of their own. In that pursuit they started construction but over a period of time, they did not get enough funds to complete the construction. They were reluctant to take the loan because they believed the interest rates would be too high so they started living in their half constructed home. After their friends referred them to MRHFL, then availed a loan and finished their construction. MRHFL has helped make our dream come true! He lives in a big joint family consisting of 3 brothers, their wives and children (17 members). Their previous house was not big and also old & primitive. So the two brothers took loans for MRHFL to make 2 new homes alongside the old one so now all 3 brothers have individual houses with their family and proper sanitation. They are happy that there is ample space for the children to study and also to keep their farming equipment and food. They took a loan to renovate and build their house roof, floor, tiles, and water leakage problem. They got their full amount on loan but suddenly Mr. Raju passed away by snake bite. They were unable to pay the loan due to the expenses they incurred in the unfortunate event. MRHFL talked to them and them settlement of loan amount is done claiming the persons insurance. They are relieved today as their mental burden has been lifted from them. His family was a joint family. After the wealth distribution in the joint family, every family got only a small space in their family house. This was very little space to live with his wife and three children. So he had a plan to construct a new house for his family. He purchased a piece of land and then started construction of the house. He had spent many summers sleeping on the terrace as the heat made it impossible to sleep indoors. His wife was quite emotional about the fact that they finally got the slab house that they have been dreaming of. He has shifted from his old house to his new house as the old one was falling apart and in a bad state. In the process of building, he completed his slab and found that he had no more funds to complete his house. After receiving the loan from MRHFL, his house is nearing completion. He even plans to construct a kitchen and a boundary wall in coming days. 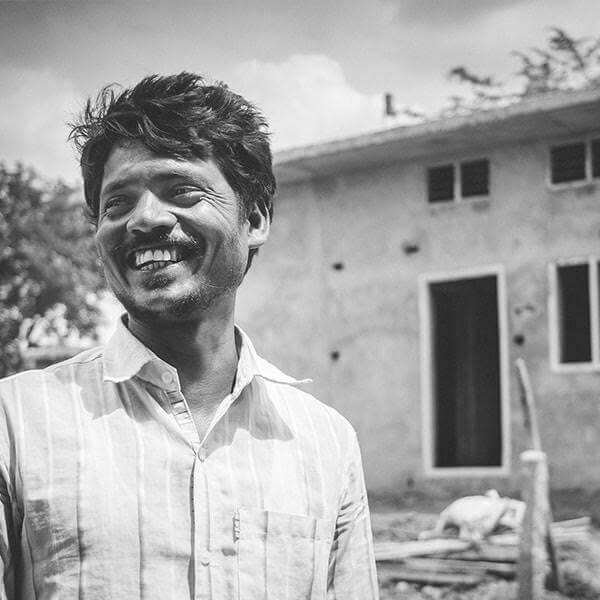 He feels happy that he is getting his own house built after all the tests and trials of his life.